“Alice and the March Hare.” Oil on canvas. Circa 1860’s, England. A great mystery surrounds one of Michael Aaron Gallagher’s oldest oil paintings, which may have ties to the classic children’s story, “Alice’s Adventures in Wonderland” by Lewis Carroll. 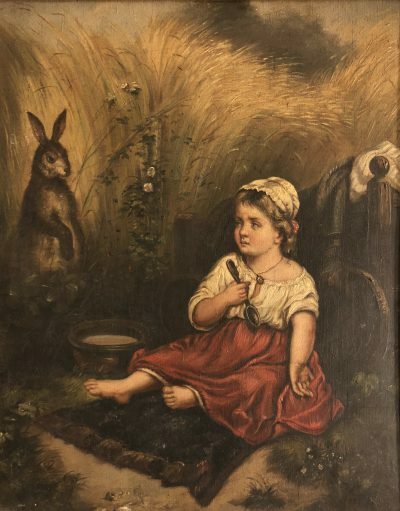 A stunning example of English Realism from the late 1800s, the figurative portrayal of a seated girl having tea with a rabbit is believed to be a folk art interpretation inspired by the characters in the novel. Affixed to the back of the frame is a tattered label that reads “Alice and the March Hare.” Some literary experts in the U.S. have raised questions about its ties to the classic story, suggesting that the label might have been added following the success of the book. They point to the fact that the March Hare was only present with Alice when she was at the table. Yet, there is also the possibility that the artist simply overlooked that detail, in a time period when more traditional countryside scenes were en vogue. Was this 19th Century oil painting an early illustration inspired by the popular children’s novel, or was it simply mislabeled years later? The answer may never be known, yet the painting still remains a classic example of youthful playfulness and childhood wonder. 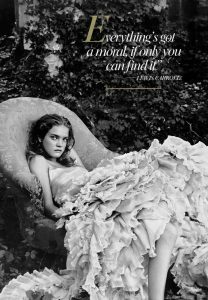 Natalia Vodianova poses as “Alice” for a Vogue magazine photo shoot (Dec. 2003). Published in 1865, “Alice’s Adventures in Wonderland” by Lewis Carroll transformed the landscape of children’s literature and forever left its mark on popular culture. Inspired by a young English girl named Alice Liddell who was enthralled by his stories, Charles Lutwidge Dodgson penned the novel and its sequel “Through the Looking Glass” under the name of Lewis Carroll. For more than a century, artists have been mesmerized by the enchanting world of Alice, each putting their own spin on the tale’s most fantastical characters and its strong female lead, visually bringing the story to life. Inspired by the colorful whimsy of Alice’s world, Michael Aaron Gallagher enjoys collecting art that captures the core themes found in the novel and its relationship to surrealism in the art world. His first piece of art based on the novel was a framed, torn-out page of Vogue magazine’s (Dec. 2003) photo shoot by Annie Leibovitz with model Natalia Vodianova (one of Michael’s favorite fashion models) in the role of Alice. “Alice” by Rachel Walker. Ink on parchment. 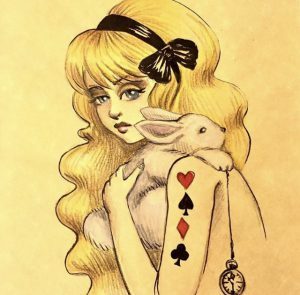 Years later, after seeing a sketch of Alice by Rachel Walker he contacted the artist, who drew another ink on paper sketch, which he purchased through the artist’s auction. As his art collection evolves, Michael continues to search for new “Alice in Wonderland” themed pieces that bring alive the magic and mystery of its pages. For more information about artist Rachel Walker and to purchase prints of her Alice sketches, visit Edge of the World Art on Facebook. To view more original works of art in The Michael Aaron Gallagher Collection click here. © 2019 Michael Aaron Gallagher - Official Site.